This Swedish band was once one of the most popular dwellers of the metal underground. The band had consistent demo sales of at least 1000 each and was a mandatory interview in most metal fanzines. Following the 1988 Toxic Existence and 1990 demo Beyond Redemption, the band drops the Convulsion tag and releases two demos in 1991 called The Odious Reflection and Wanderland and EPs on France's Thrash Records. The band signs for five albums to Germany's Nuclear Blast Records. The act releases a technical death metal album that does not sell well and the band switches styles and labels to play heavy metal on Massacre Records. The remnants of this once proud band is later called Molasser. What an appropriate name for this album! After dropping the 'Convulsion' half of its name in 1990 the Stockholm death metal group issued a couple of demo before being snapped up by Donzdorf's Nuclear Blast Records. The contract had the band to the label for five albums, but Prodigal Son would become the band's only full-length contribution to the German label's catalogue and thus rendering the album title even more apt. Having said that, the title is more so a fit because of its musical content. Prodigal Son is the clear offspring of the prevailing Swedeath sounds of the early '90s. The hyper distorted buzz of the guitars, grinding crunchy rhythms, tentacle drumming and death wails are all here. The group had also given in to recording at the famed Sunlight Studio with Tomas Skogsberg, which rendered the sound even more of a Swedish death metal buzz. Why did it not work then? First and foremost, as typical and analogous as the band's sound was, the songs were not of the same quality as a Grave, Dismember or Entombed. Moreover, the band has an affinity for complex patterns rather than straightforward bash-your-head-in death metal. The challenge is exacerbated given the muffled sound. The production, which was accomplished in just over two weeks, might have been adequate in 1992's death metal circuits, but even then was not potent. Mostly though, it is the band's penchant for doing its own (more involved) thing that made it. The group's flowery image probably didn't help either. The band's photograph depicts it with the same image that did Tribulation in. No wonder the album has an intro with what sounds like a sitar. Nuclear Blast never released another album by the five, but its favourite song clearly was the more easily digestible Tidings From The Blue Sphere. An alternate version of the song appeared on the label's Death Is Just The Beginning II compilation. Rising To The Sun has a veer towards early Tiamat. The Empty Word has parts, which could have been Grave when the latter band slowed down even more. 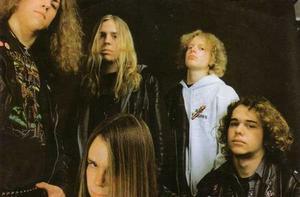 Consumed In Flames and Ivory Tower deliver death and improvements, but tugged into the back of the album by the group. Listen for the gruff growls of singer Joakim Broms who nonetheless is often understood. Additionally there are the tormented wails of Swedeath (see Entombed's Left Hand Path) as well as the tracks melding into one another as Swedeath tracks from different bands were likely to do. This is a respectable release, a little different and clearly a moment in time, but one would not call Prodigal Son essential. - Ali "The Metallian"